The event started with the screening of the documentary “Missing in Pakistan”. This was followed by a speech from Pakistan Professionals Forum spokesperson. He condemned the government for terrorizing its own people and wondered how Sehba Musharraf should feel if her son, Bilal Musharraf, went missing. K. Asif, a student representative, condemned the intelligence outfits for their role in extra-judicial arrests and vowed complete support to the families of missing persons on behalf of the students of Islamabad. Next, Zafar Jan, a relative of a Baloch missing person, claimed that around 12,000 Balochis have been abducted. He lamented the fact that the media had no access to Balochistan. Shahid Kamal Khan, ex-president Mailsee Bar Association, said that armed forces have no legal right to intervene on its own in the affairs of the country until and unless requested by a civil government. Furthermore, armed forces or intelligence outfits have no right to detain or kill its own people. He vowed to register an FIR for murder against Pervez Musharraf. This was followed by a talk by Mrs. Amina Janjua – the wife of Masood Janjua, missing since May 2005, anchorperson of the organization ‘Defence of Human Rights’ and spokesperson of the families of the missing persons. She related their struggle to win the release of their family members, through street demonstrations as well as their meetings with various politicians. She implored civil society activists, lawyers, professionals to continue supporting the cause of the missing persons. Furthermore, she expressed her gratitude to lawyers in the UK and the US as well as the chief counsel of missing persons, Shaukat Siddiqui, for their support. Civil society activist, Ghazala Minallah, empathized with the unrelenting pain of the families of the missing persons and deplored the hypocrisy of world powers. She assured the families of her continual support. Sardar Asmatullah, president Rawalpindi High Court Bar Association, reiterated the civil liberties guaranteed to the citizens of Pakistan by its constitution. 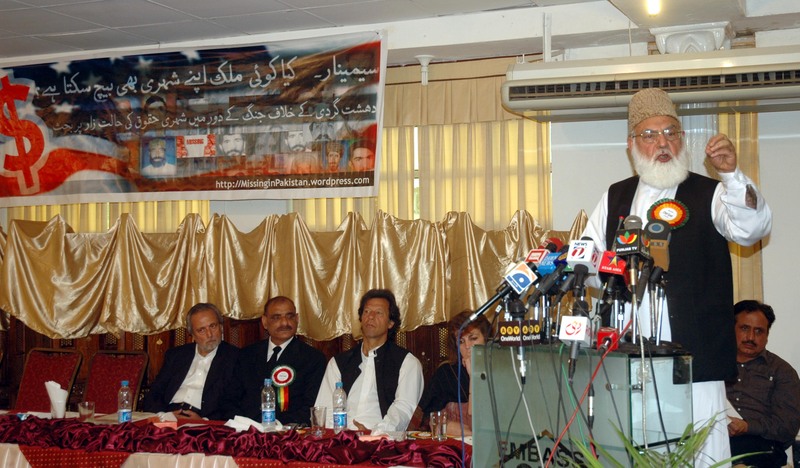 He condemned Pervez Musharraf for illegally imposing martial law and rendering the Chief Justice non-functional, and demanded the impeachment of the President for subverting the constitution. Hameed Gul, ex-head ISI, condemned the collusion of successive governments in selling their own citizens to world powers. He demanded justice for the students of Jamia Hafsa and highlighted the importance of a strong and independent judiciary to safeguard the rights of citizens. He further demanded that Pervez Musharraf be court-martialed and charged for high-treason. 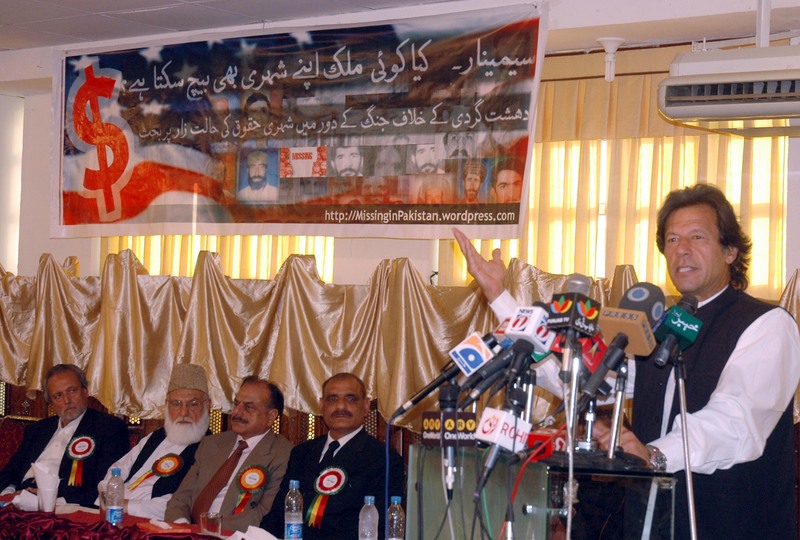 President PTI, Imran Khan, challenged Pervez Musharraf to declare the number of Pakistanis killed in the war on terror and called for his impeachment. Later, Justice (R) Wajihuddin pointed out the weakness of courts to curtail extra-judicial detention. He called for investigating the perpetrators of extra-judicial detention. Furthermore, he opined that Pervez Musharaf’s regime is dwindling and that Musharraf’s removal will have a critical impact on the results of the US election. 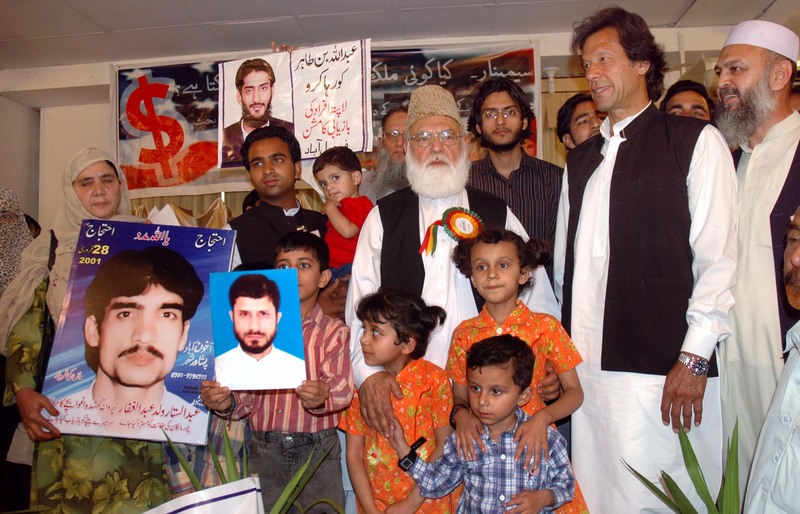 Finally Qazi Hussain Ahmed, president JI, condemned the acts of Parvez Musharaf and his allies and said a prayer for the families of the missing persons. More than 500 people from all walks of life were present there to show solidarity with the cause and with the aggrieved families. Seminar in Islamabad – Do Countries Sell Their Own People? Since the seminar in Lahore on March 23rd, the number of missing people registered with the organisation “Defence of Human Rights” (DHR) has gone up to 546. As the war machine grinds relentlessly on, it is up to us, common citizens, to come together and work to end the menace of state-sponsored violence. In order to sensitize the people of Rawalpindi and Islamabad to one of the biggest systematic crimes against humanity, the Pakistan Professional Forum, civil society, Pakistan Youth Alliance and the families of the missing persons are organising a seminar “Do Countries Sell Their Own People?” on April 17, 2008 at 3:00 PM, at Embassy Lodge, Club Road, Islamabad. Introduction to the children of the missing persons and their group photo with the speakers. Prayer and resolution at 6:00 pm. A seminar on human rights was held at the HRCP auditorium at 3 PM on 23rd March 2008, the 68th anniversary of the adoption of the Pakistan Resolution. Entitled “Do countries sell their own people? A discussion on civil liberties in the age of the War on Terror“, the event presented the plight of the families of the victims of state-sponsored kidnapping. The venue was filled to over-flowing with representation from a broad cross-section of the general public – lawyers, journalists, human rights activists, students and young professionals. The event started with a reading of N.M. Rashid’s poem Zindagi say dartay ho, followed by a screening of the suppressed documentary Missing in Pakistan. This was followed by a talk by Mrs. Amina Masood Janjua, wife of Engineer Masood Janjua, missing since May 2005 and spokesperson of the families of the missing persons. She related their struggle to win the release of their family members, describing their street demonstrations and their meetings with various prominent political personalities. She expressed her immense gratitude to the Chief Justice of Pakistan, Iftikhar Muhammad Chaudhry, who had secured the release of more than a hundred missing persons and lamented the fact that this process had come to a halt with his deposition. She mentioned that they have now started gathering incriminating evidence against President Musharraf, Chief of Army Staff General Kayani, Secretary Interior, Kamal Shah, IG Punjab and IG Sindh, linking them to the kidnapping of their family members. She thanked the audience for attending the seminar and appealed to them for their help in reuniting the more than 500 persons still missing with their families. Zainab Khatoon, talking about her missing son, was overcome with emotion and appealed to the audience to help her secure his release. Mr. Syed Tufail Shah, aged principal of a high school in Peshawar, made a simple appeal for the release of his son. Counsel for the families of the missing persons, Shaukat Siddiqui as well as Chaudhry Amin, Secretary of the Supreme Court Bar Association, also spoke on the occasion enriching the discussion with information on the basic rights of the citizens of Pakistan as laid down in the Constitution. The seminar ended with a brief Q&A session with the speakers. The last collective act of the assembly was to rise up and observe 30 seconds of silence as a mark of respect for Indian freedom fighter Bhagat Singh who was hanged by the British in Lahore (at the site of present-day Shadman Chowk) on 23rd March, 1931. The event brought together people with very divergent perspectives and political affiliations all of whom nevertheless share a firm belief in constitutionalism, pluralist democracy and human rights. The event was organised by the Students Action Committee, Young Professionals and FASTRising. [Addendum, March 26, 2008]: The organisers would like to thank the extensive coverage provided to the event by various media outlets, both print and electronic. See articles in Dawn (may require creation of an account), BBC Urdu and Daily Express (you may have to allow popups from express.com.pk). Mrs. Amina Masood Janjua’s organisation “Defence of Human Rights” has collected data on Pakistani citizens who have gone missing as a result of the tactic of “state-sponsored kidnapping”. This data needs some cleaning up and we invite volunteers for the job. If interested, please write in to either youngprolhr or aileeeNU (both gmail accounts belonging to interested activist groups). You can have a look at the raw data here. Given that more than 2000 Baloch and Sindhi nationalists are said to be in illegal custody, this list (with 529 names) is by no means complete or comprehensive. Its value however lies in the descriptive information that has been collected for each missing citizen. Do Countries Sell Their Own People? Balochis and Sindhis missing: more than 2000! According to the Maintenance of Public Order (MPO) rules, a suspect may not be held without charges for more than ninety days at a time. Is it acceptable to you as a citizen that a fellow countryman is detained without charges for an indefinite period of time and without recourse to legal advice nor notification to his family? If a pattern of similar detentions emerges, how do you respond? Furthermore, how should one react if it emerges that detainees are often tortured in custody? Then, if all the detainees are either bearded or Baloch or Sindhi or journalists, should ordinary citizens campaign for their release? According to their political, religious, ethnic or professional motivations? Or is there a larger principle at stake? Just as importantly, are all bearded men Islamist terrorists? Are all Balochis and Sindhis who desire greater autonomy from the Centre necessarily traitors or separatists? And what if the “general opinion” is that the majority of the detained people are dangerous elements who are likely to be involved in terrorist and/or anti-state activities? And that the law-enforcement/counter-espionage agencies that have kidnapped them will be unable to prove their cases in court? That as a result of upholding the rule of law, ill-informed citizens may win the release of some dangerous terrorists who do not seem to discriminate between combatants and non-combatants? But, then, what if the public remains indifferent to these questions and the State gains in confidence to the point where it feels secure in arbitrarily detaining anyone who dares to criticize its policies? Is that such a remote possibility? Do we have enough confidence in the basic humanity and decency of state functionaries to grant them extraordinary discretionary powers to detain people? If these are questions that plague your mind and your conscience, please join us for a discussion on civil liberties in the age of the War on Terror. You can use the English transcript of the film if you want to add sub-titles or to dub the film in your own language: Transcript of Missing in Pakistan (English). Leave a comment on this blog if you wish to translate/dub the transcript to Punjabi, Sindhi or Spanish. and now French sub-titles (VOSTF)! Some activists in Switzerland have added French sub-titles to the film. This version is available here. Independently produced documentary about the abduction and illegal detention of Pakistani citizens by Pakistani intelligence agencies. The film is circulating informally among concerned citizens in Pakistan as the subject is too “hot” for commercial channels. This is truth-telling at its bravest, unflinching best. The first frame credits a producer but given the explosive nature of the document and the state of fear in the country, there is serious doubt as to whether the person’s real name was used. There are rumours that it was produced in Karachi, but this has not been confirmed. Again, no information came with the file. All we know, judging from the events depicted in the film, is that it was produced at least three months after March 9th, 2007 and before the landmark decision over-turning the ex-officio status of Chief Justice Iftikhar Muhammad Chaudhry. Narration in English. Most of the speech in Urdu, except for the exchanges in the harrowing protest scenes, has been subtitled in English. The FAST Rising blog mentions that their group’s screening was interrupted by the school’s authorities. Other than that, it is understood that some small groups – often human rights activists – have arranged invitation-only screenings. 1. Upload the AVI file to other file sharing mechanisms (popular servers as well as decentralised P2P networks). 2. Upload the film to other video sites. 3. Share widely among friends and family. 4. If you are a member of a film club or know of one in your locality/region, arrange a screening. 5. Step up your support for the campaign against the phony “war on terror”. Streaming and some download possibilities on Veoh.com, video bit rate: 192 bps – tagged by publisher as mature content due to some violent scenes. AVI file download from Rapid Share, video bit rate: 512 bps – makes you jump through hoops, likely to fail if your connection is slow. More to be added as word spreads.